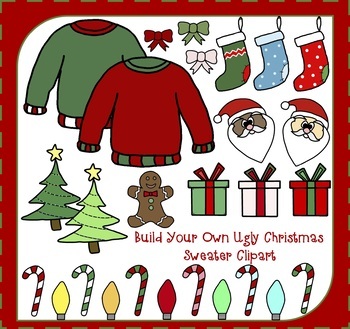 I am offering this Build Your Own Ugly Christmas Sweater - Christmas clipart set, which has awesome Christmas decor clip arts to make your lessons and/or anything else look GREAT and ready for Christmas! This is a 36-piece set both in black & white and in color!! 27 colored graphics and 9 black & white versions.